Welcome to a personal view of Chuck's weekly paintings, drawings and other creative endeavors. One thing about painting from life...life happens. I was just getting into this little 5x7 when someone showed up at my doorstep. She was here to buy a couple of paintings ( a good and worthy distraction )...when I got back to the painting a half hour later the sun had shifted an unreasonable amount...all values on the windowsill totally changed. How could it be? I considered wiping it all off, but went ahead and finished the little darlings off as best I could. God I'm having fun. Seriously. hi chuck, I read your comment on Katherine's blog about david Hockney, are these the watercolors you were thinking of? p.s. your paintings are terrific!!! Thanks again for the p.s. LOL at your title! I had to buy some of these little pumpkins for my son's class this week. When my husband asked if I was going to paint one, I said I might to the "obligatory pumpkin" for October. Then I see you already did! 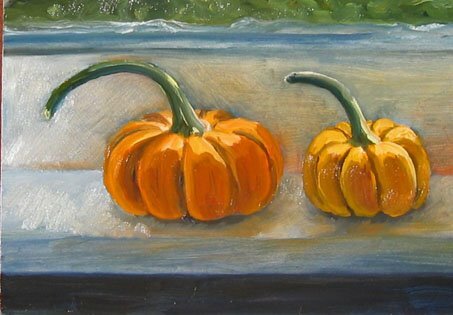 The warm colors of the pumpkins really stand out from the cool shadows - great work! I do, actually, love to paint pumpkins. They strike a chord with some early art memory. I'm not even really sure what it is...probably cutting them out of construction paper in first grade :) I always end up giving the pumpkin paintings away as gifts. I guess you could call them a "Comfort Painting" kind of like macaroni and cheese; reliable, orange... and, well comfortable. I've painted on the side all my life. In 2005 I started painting full time. Starting with the trompe L'oeil series "Scatter Paintings" and small "Daily" paintings. In 2007 I made an about turn to plein air work and Landscape painting...a subject and style that still keeps me captivated 12 years later. This internet diary keeps track of my progress. Unless noted, all the paintings posted on this blog are for Sale. You can contact me at CLAW4JC@aol.com for pricing and billing information.